Wind is a renewable energy source, meaning that it can be produced over and over again, never running out. The energy we currently get from fossil fuels, on the other hand, won’t last much longer. Wind energy will reduce our reliance on fossil fuels, solving the problem of our ever-increasing demand for gas and petroleum products. Wind energy can also be produced right here in the U.S., make us less reliant on other countries for our power generation. Wind power produces green energy. It is the cleanest form of all renewable energy, creating absolutely no pollution. Fossil fuels emit harmful greenhouse gases, potentially causing climate change, but wind energy comes from the sun and does not release any toxic gas. Less pollution means a lower risk of disease for humans and damage to the environment. 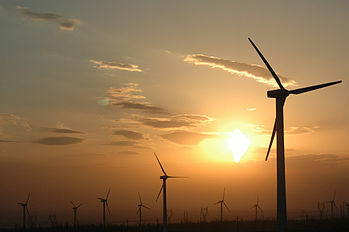 The most substantial cost of producing wind energy comes from the installation of the turbines. However, the cost has decreased over the past few years, and when combined with solar power, wind provides cheap and reliable energy for both developed and developing countries. If you own a large plot of land, you can even earn some additional cash by installing wind turbines for agricultural purposes. State governments often provide interest-free loans or incentives on wind turbines. You can use the electricity generated for your own purposes, thus reducing your monthly utility bill. As a renewable energy supplier, your surplus energy will be sent back to the local grid. More wind turbines are installed every year all across the globe, as energy suppliers discover the many benefits of using wind power. There’s no doubt that as the demand for electricity increases, so too will the prevalence of renewable energy.